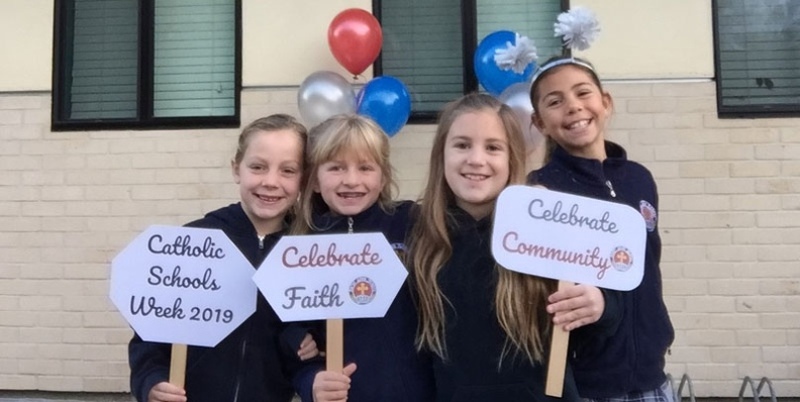 Catholic Schools Week 2019 was a big success at Saint John School. With the theme of Learn. Serve. Lead. Succeed., the Saint John community celebrated in both traditional and new ways. On Monday, we celebrated our community as well as took the opportunity to serve others. New this year, a photo booth was set up for students and staff to record the joy found in our community. Students enjoyed donning costumes and props to create unique photos. Additionally, it was “Walk a Mile in their Socks” day. With the donation of new socks for those in need, staff and students were able to wear crazy socks with their school uniform. A sizable donation of socks were delivered to Father Joe’s Villages as a result! Tuesday of CSW was a hit! To celebrate our students, teachers declared a “no homework” day! To celebrate our nation on Wednesday, everyone wore patriotic dress and donated canned food to the Saint John Parish Food Pantry. Additionally, our middle school students participated in our annual Spelling Bee. Congratulations to 8th grader Andrew P. who will go on to represent Saint John School in the San Diego Union-Tribune Countywide Spelling Bee. Thursday, students celebrated vocations by dressing up in a costume that represented what they want to be when they grow up. Students also celebrated the staff and volunteers by honoring their efforts and showing appreciation. One of our favorite days of the year rounded out the week. On Friday, we celebrated our families by hosting Grandparents’ Day. A long-standing tradition, our grandparents joined us for a reception, classroom visits, and a show with musical performances by each grade level. The day concluded with the celebration of the Mass. We were blessed to be joined by over 300 grandparents!